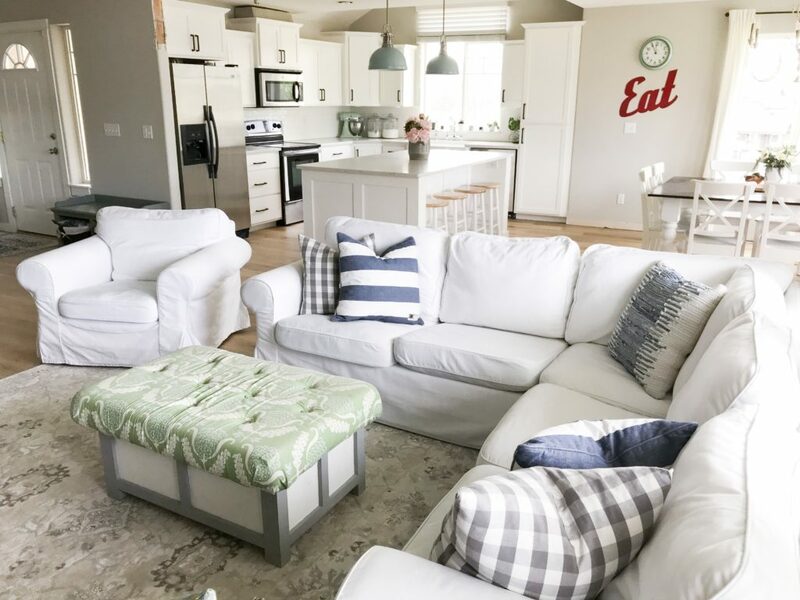 What a little Woo can Do: A Kitchen Remodel - Jenuine Home - Interior design, decor, diy for your home and Instant Pot Creations for your tummy. I’m about to get a little woo woo with you guys, but hang in there with me, ok? I promise I won’t get too weird. When we first walked through this kitchen (within 2 hours of when it listed on the market), I knew the floor plan it was meant to be. Now, it was a nice kitchen as it was. In fact, it was far better than most houses that were on the market and it was plenty big. It was big enough to have a party in the middle between the island/sink and the stove. Yet I knew the floor plan it needed to be for best layout and functionality for cooking. 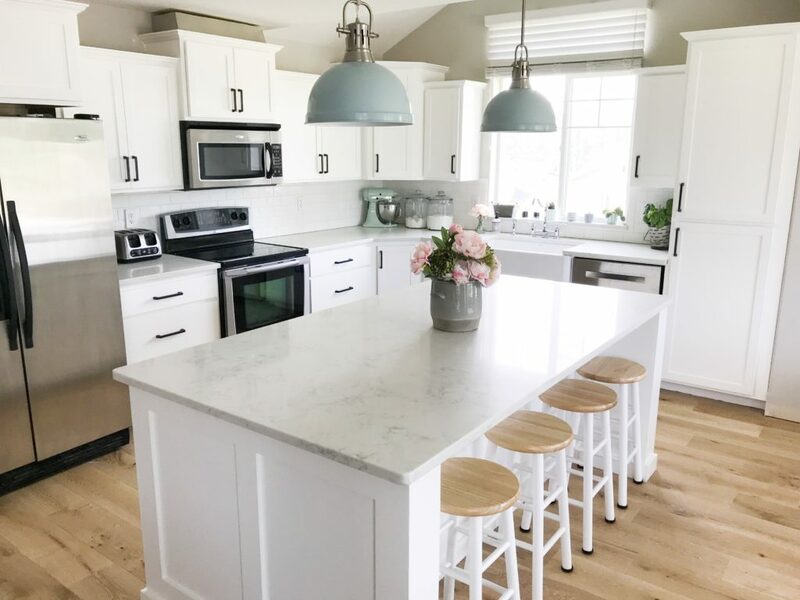 Hubby agreed that we could make those changes eventually for my dream kitchen (like 5 years down the road) because he knew how much it meant to me to have the white kitchen I dreamed about since I was a child. As we used the kitchen for the next several years, I continued dreaming in the meantime. Sometimes, when I couldn’t sleep, I would stand in my kitchen with a measuring tape in hand, pencil in my bun on top of my head and measure the cabinets again and plan the island placement/distance that I thought it should be. 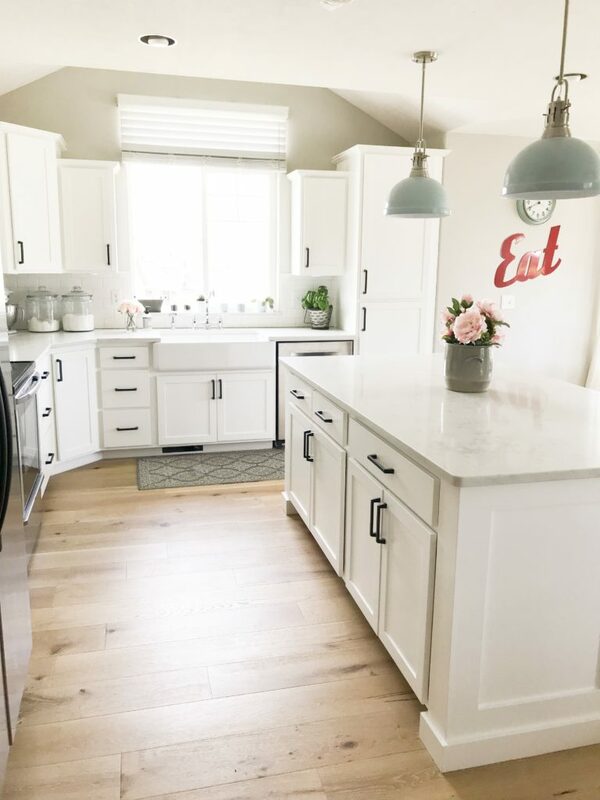 My favorite things to pin on pinterest were plans for my dreamy white kitchen. I visualized it often as I was falling asleep, yet my dream seemed far away. Money for the project never seemed to gain momentum as other needs kept coming up like the new (used) van we needed, replacing a broken washing machine, or installing new fencing that was torn down in a blitz windstorm. I grumbled about doing dishes in my too small stainless sink with my ill-spraying faucet, yet feeling guilty because I knew I was being selfish when others don’t even have clean running water. Here I am complaining that I can’t see the stuck on food and dirt hidden on the black laminate counter tops and feeling frustrated at unsuccessfully wiping down the slate tile backsplash that the prior owners thought would be a good idea for kitchen backsplash, when other people are worried about having enough to feed their family. I continued in my ungratefulness every time my messy hands would drip after cracking a egg to fry at the stove and I would have to walk 10 feet to the sink in the island to wash my hands, dripping raw egg across the floor as I went. 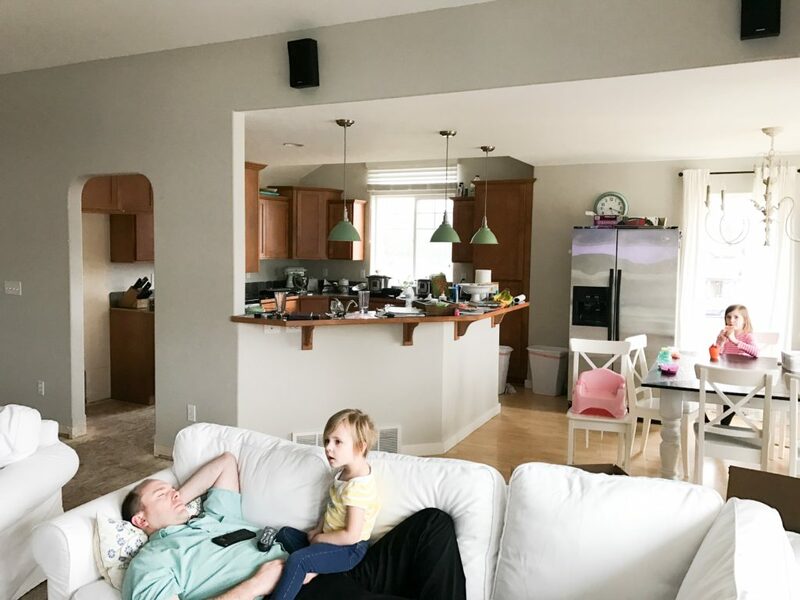 I mean, I was thankful for my kitchen but I kept focusing on all of the things that were wrong about it that I wanted to fix and I often overlooked the good things as I kept dreaming of that someday kitchen it was meant to be. Then one day it hit me. I had been reading a book about manifesting the life you want. I’m a huge believer in using the Law of Attraction principles as I had used it to successfully heal myself from daily migraines that I used to suffer for 18 months after the birth of my second daughter. But that’s a story for another day. I was reminded that I needed to love my kitchen and be so incredibly grateful for my kitchen as if it was already my dream kitchen. 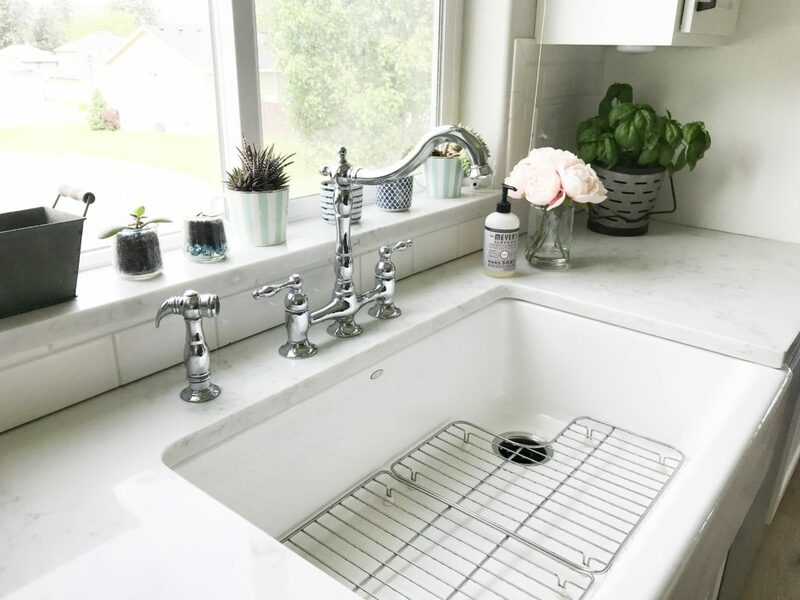 That meant washing my dishes every night and wiping down the counters, taking just as much precious care of it as if it already had dreamy white quartz counters with white cabinets. 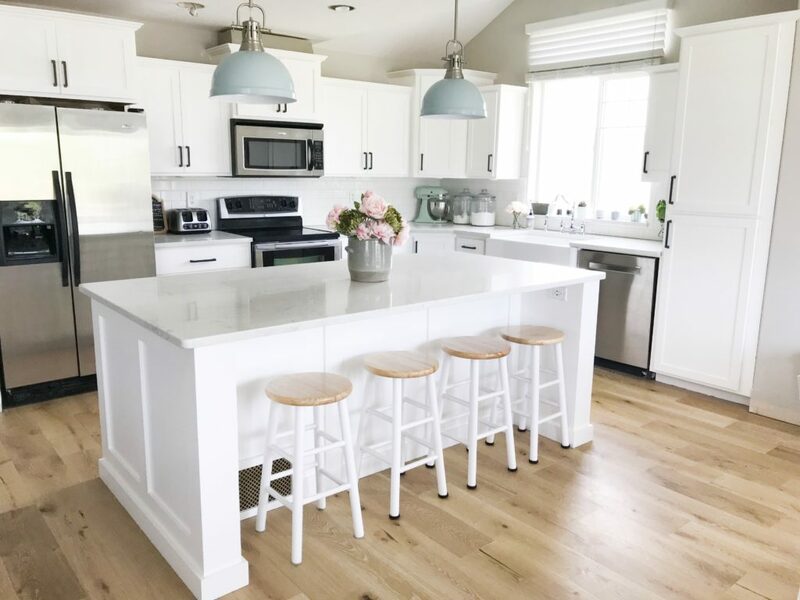 It meant repeating,”I’m so thankful for my dream kitchen” as I scrubbed stuck food off those black laminate counter tops, and really feeling the excitement and joy behind those words. I had to trust with full belief that my new kitchen was already here and done. I did this routine as I cleaned my kitchen as often as I remembered to do so. Three month’s later the flood happened. The water hose line connector in the wall that went to the fridge’s water/ice machine maker had slowly leaked into the wall/floor. We didn’t discover this fleak until water was squishing out when we walked on the floor in front of the fridge. Immediately I KNEW this was a blessing and meant I was going to get my dream kitchen. Hubby didn’t believe me. The contractor didn’t believe me. I felt like it was God saying,”here you go Jennie. Here’s the kitchen you’ve been wanting. 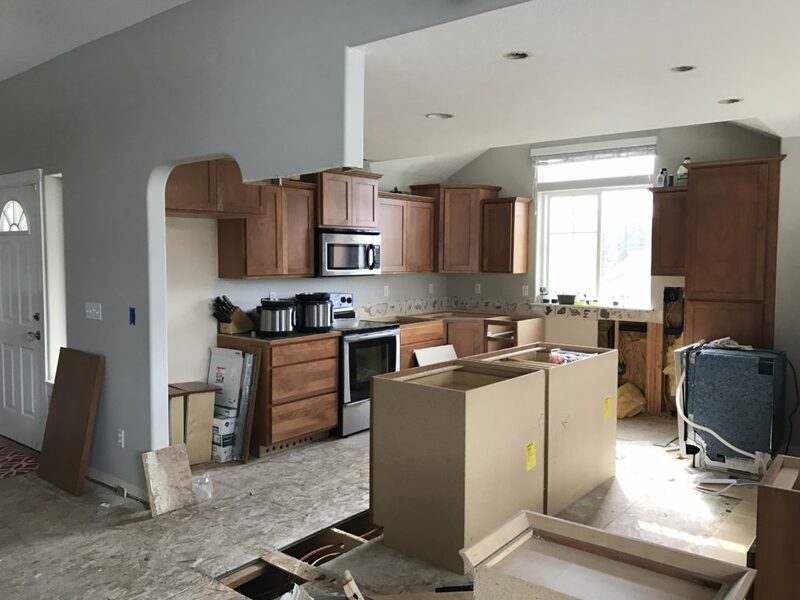 This is your chance.” This kitchen remodel was about to get it’s woo on! Sure, we could’ve just used the insurance money to just replace everything as is, which was hubby’s preference. That would cover professional labor and supplies to install the new equivalent laminate flooring. 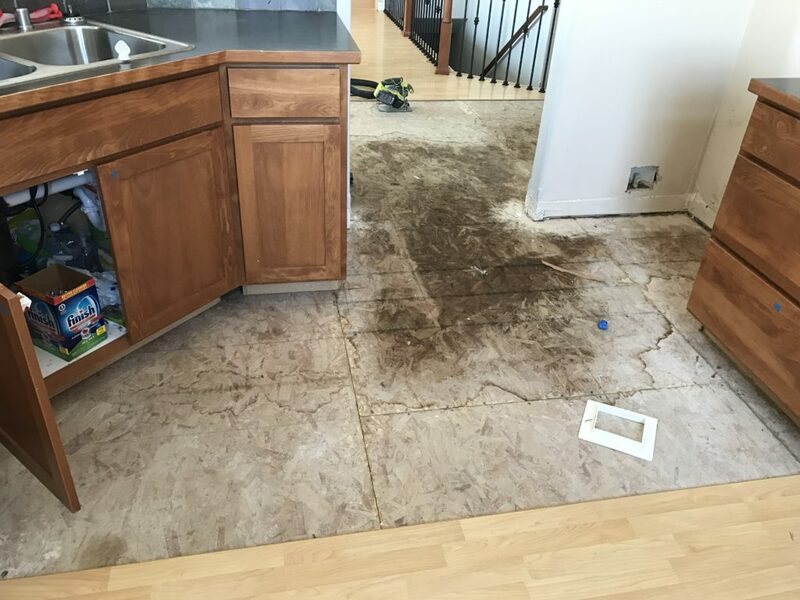 The flooring had to be replaced until there was a natural break in the flooring, which meant all through the living room and down the hallways because of our connecting open floor plan. 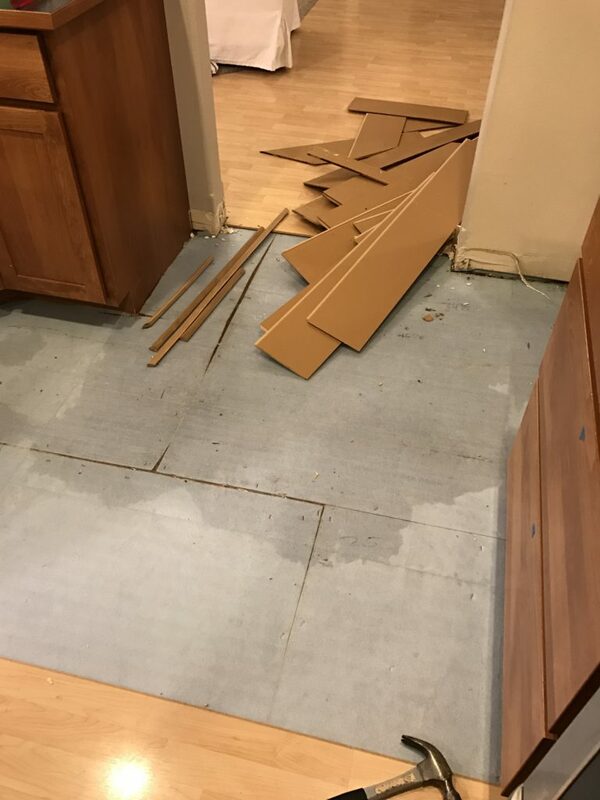 However, if we wanted to ever redo the layout of the kitchen, now was the only chance since it would mean laying flooring in different spots than the current kitchen layout (because of future island relocation). Somehow I convinced hubby to have us do the work and to use the savings in paid professional labor towards upgrading our counter tops, sink, lighting, etc. We worked our butts off to use every dime of the insurance repair money (that was mainly to cover the cost of new laminate flooring) to the maximum. Then hubs got a surprise bonus check from work the day I was going to place an order for our new inexpensive flooring option. This bonus check was the perfectly timed blessing to now cover the amount we needed to upgrade the flooring to the dreamy hardwood I’ve had my eye on and originally wanted. Lucky? Heck yes! 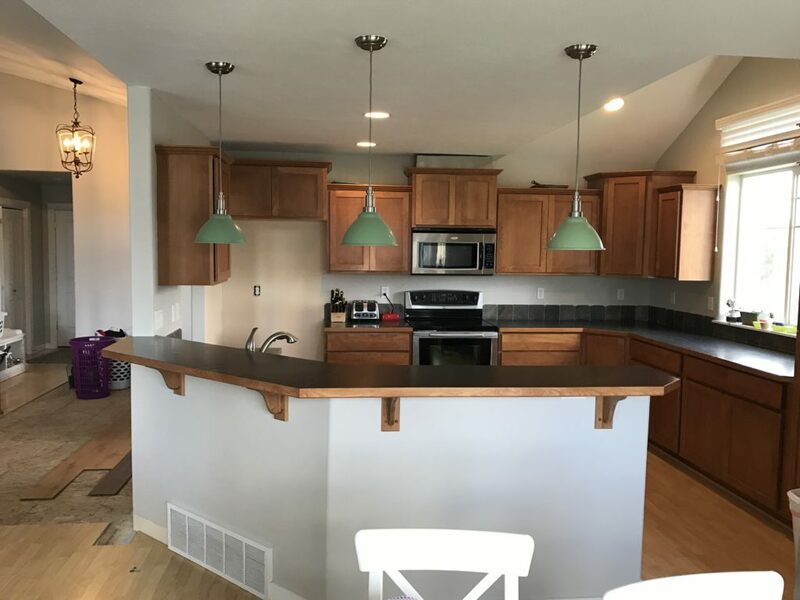 Woo to the max for this kitchen remodel! 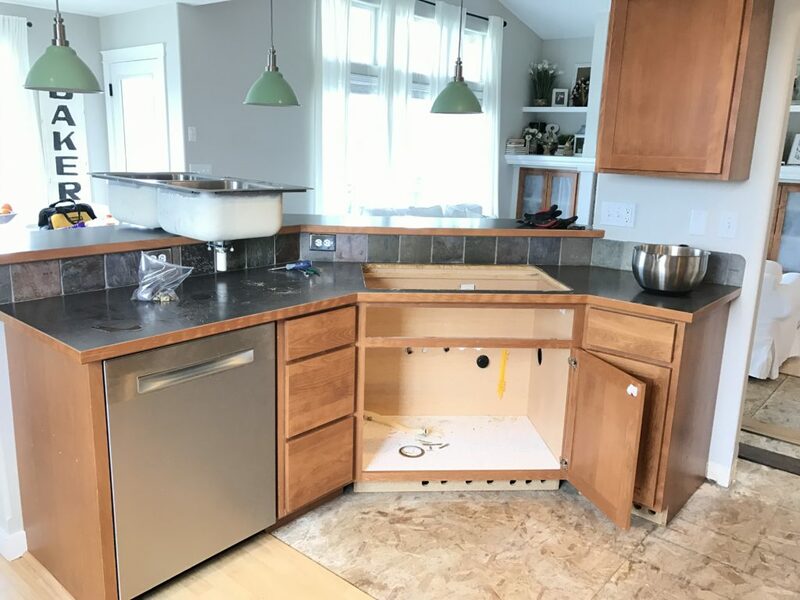 We did hire out for relocating the plumbing from the island sink to underneath the window and for professional electricians to make sure everything was done to code on this major remodel. We were also blessed with multiple friends who came and helped us with demo, another who spent the afternoon teaching us how to level and reinstall the kitchen cabinets, and yet another friend who spent his Saturday making sure our new island was exactly square as he shared his wood cutting knowledge with us. We are forever grateful to their service. 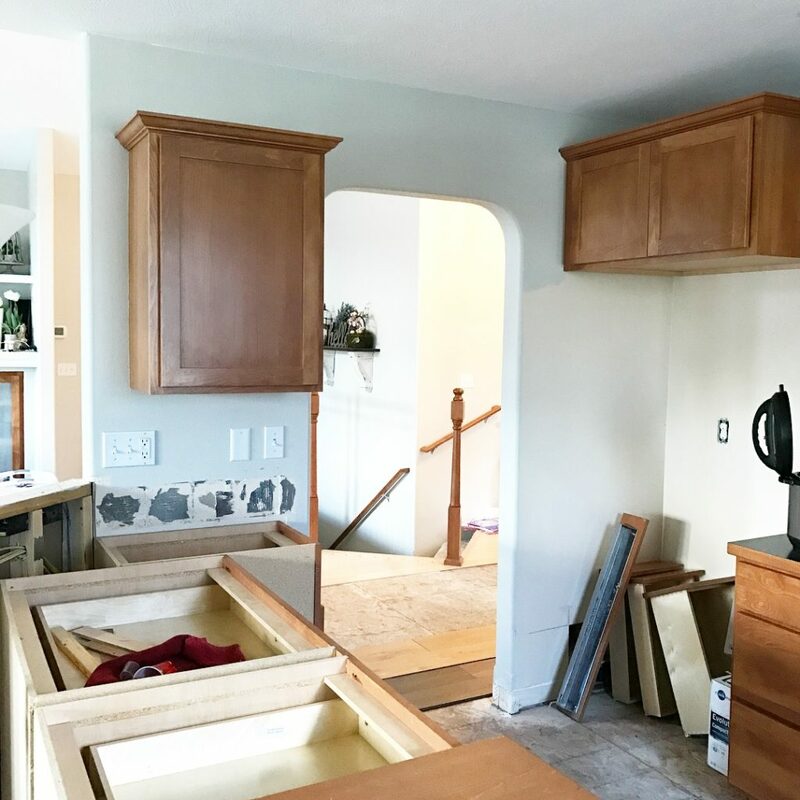 What a miracle it was that we were able to reuse the existing kitchen cabinets. We took out the ones underneath the window and made them the new island. The old island cabinets became the new ones under the window. They were a perfect swap of measurements. Coincidence? Nah. Just another bit of woo for a kitchen remodel. Stay tuned for upcoming posts, detailing the process and products used. Thank you Stacia! Big hugs! I miss you and can’t wait for when you get to see it in person! Your kitchen is a breath of fresh air and reminds me that my dreams of having a repainted kitchen are about to come true! YASSSS! Your kitchen dreams are happening in less than 1 month!! I’m so excited for your kitchen transformation and to see you again! I love how your kitchen turned out. So clean and crisp. You are a blessed woman. Also, the website works great and looks perfect on mobile. Thank you so much Rebekah! I feel very blessed indeed to have this kitchen! And very thankful for your amazing hubby that helped us too! Karen, you sweetheart! Thank you so much for always being a cheerleader and seeing the vision I had planned years ago! The new kitchen is fabulous. I, too, dream of a new kitchen one day. I see light grey though and not white for me. Congrats. Thank you Laurie. The grey kitchens I’ve seen are lovely. I hope you have your dreamy grey kitchen someday! You did such a good job!!! Light, airy and cozy! I love those lights just the perrrrfect pop of color!! Thank you Erica! It took me a couple of months of begging and convincing to my hubby to let me do blue pendants! So glad he finally caved. 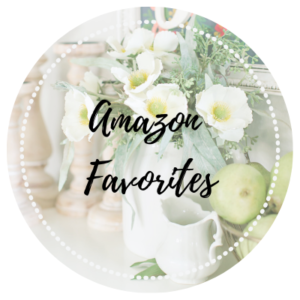 LOVE LOVE LOVE your designs, crafts, and recipes. Thank you for sharing! Lovely kitchen! Turned out so nice! Thank you so much Camille. I hope you’re settling in your new home! Thank you April!! It really was an incredible process. I love all the details and how hard you worked! It looks amazing!! Thank you so much Cari! I love that you were able to see the progression of it too! Your kitchen looks AMAZING! Wow, it’s like someone turned the light on. So much brighter. I like the straight island so much better than the old angled one. You did a great job on the website too! Amen! I hated the angled shape of the previous island and love having my working space so close to the sink, stove and fridge now! I love how bright it is in here too! Thank you! So gorgeous! I love how you were able to see the blessing in disguise. Thank you Martha! I am so thankful that the flood happened so that this could be made possible! I’m so impressed that you guys were able to re-use cabinets and do so much work yourselves. 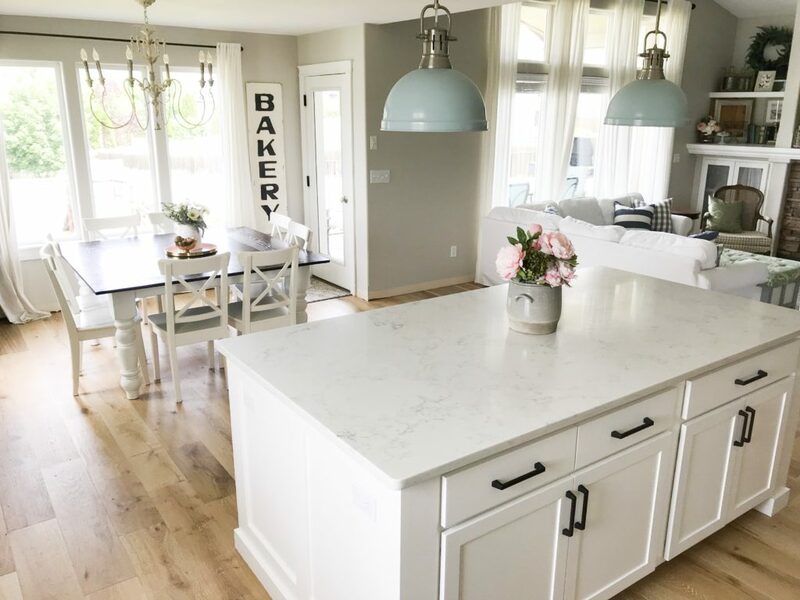 Your new kitchen is gorgeous, enjoy! Thank you so much Lara! 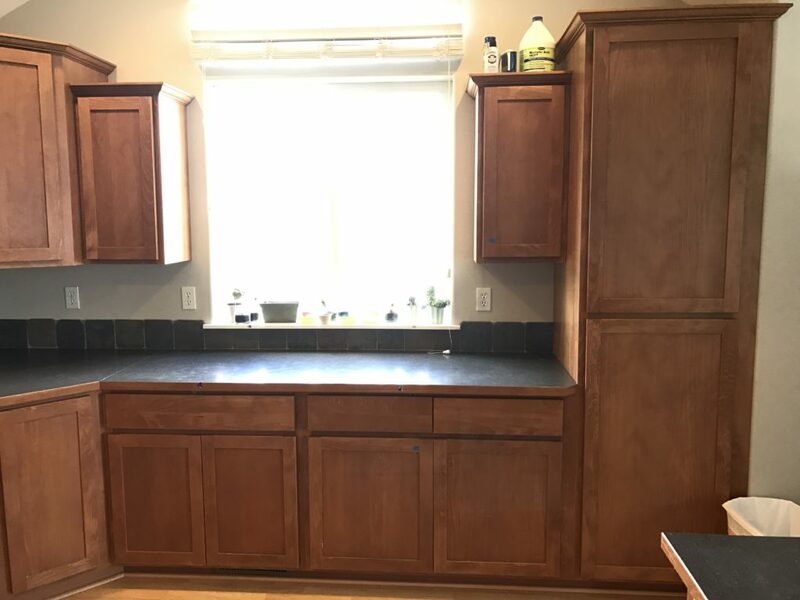 It really is so wonderful that those cabinets swapped perfectly with each other and we were able to reuse all of them! It was a lot of work and I’m so glad it’s done! Okay I totally saved the link so I can constantly reference how to do hard boiled eggs in my Instant Pot…I’m so lame! So glad I have such an amazing friend who is so talented and has good taste in style and food! Lovely little website Jenn although I’m not surprised at all!!! This is STUNNING and totally what I’m dreaming for my new home we have now. The kitchen needs an upgrade bad! Loved your heart to love it anyway until that dream came true! Thank you for sharing!! Thank you! I’m so glad this gives you some inspiration for your new home! I hope you can make it your dream kitchen soon! I love the repositioning of the island! 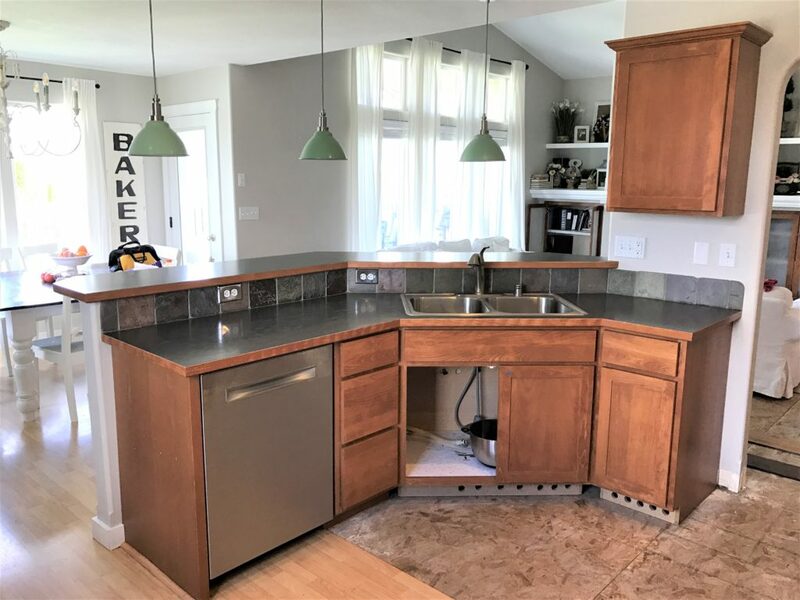 I have an angled sink area with a small island and would love to pull out some of my cabinets and have a big old island like yours! Great job!! Thank you! I wish you could do the same for your kitchen too! Is there any way it could work? I know redoing the flooring is always a hang up. It was with ours (I had been dreaming of redoing the layout for 5 years) but once the flood came and ruined the floors anyway, I got my chance to redo the layout! Congrats!! Your kitchen looks beautiful! I especially love your hardwood floors! Thank you so much! 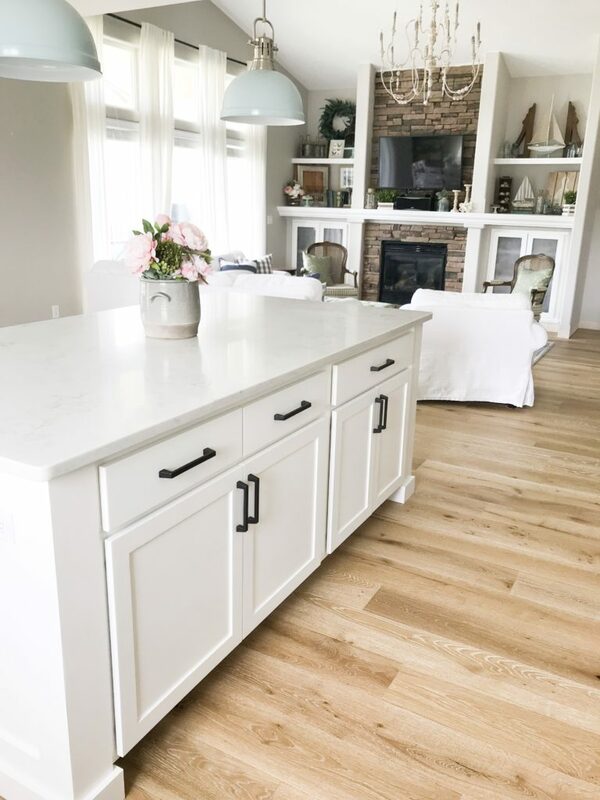 I love how these floors look in my home! I love these lights!!!! The blue is amazing! Your whole kitchen is gorgeous, Jennifer! Thanks Julie! I just adore these blue lights! Thank you Rita! It was so much work but absolutely worth it. I love seeing it every single day!